The wait seems to have been interminable, but yesterday saw the publication of my latest book, THE CALL OF EIRIAN. Book design by Alex Ferrari. 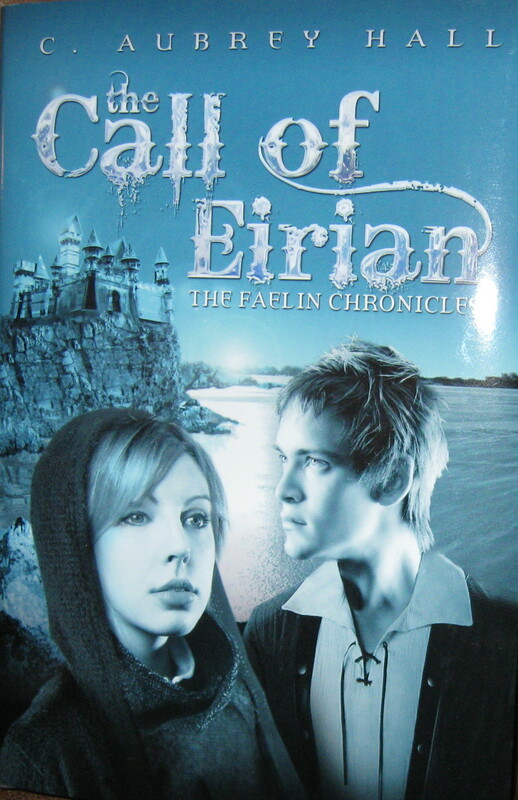 THE CALL OF EIRIAN (c) 2012 is published by Amazon Children’s Publishing. This YA book is the second of THE FAELIN CHRONICLES trilogy, coming out under the pen name C. Aubrey Hall. I’ve always found the middle books of trilogies to be challenging to write. Similar, in fact, to the soggy center of any story where it is so easy for the tale to falter, sag, slow down, or just sink. However, I don’t believe THE CALL OF EIRIAN suffers from those maladies. My young characters–twins Diello and Cynthe (having been orphaned in the first book, CRYSTAL BONES)–are well on their difficult journey to the kingdom of the Fae. They’re in a race against Nature; winter is coming fast. They’re hindered by not being able to use their magical powers; using magic leaves a trail for the goblins to follow. And although they’re certain that if they can just reach the Fae their problems will be over, they find that the land of Embarthi is less than welcoming to Faelin such as themselves. Politics, adventure, and magic are entwined in this book, as in most of my fantasies. I think fantasy is always a setting for a power struggle. Whether you’re in a cute Brian Jacques yarn about an evil Portuguese rat trying to conquer the gentle mice of Mossflower or a Robert Jordan epic, the political struggle is going to be there. I have to admit, though, that quests are not my favorite plot structure. Unless it’s a l-o-n-g chase, the conflict can unravel into just one mishap after another. I prefer tightly focused antagonism. Quests also offer a challenge in that a writer has to keep topping each segment of adventure as the story builds to a climax. And of course, being that it’s a middle book, the climax has to resolve the immediate problems of the characters without tying up the whole story. Despite the hard work, coming up with the magical elements of Embarthi was a great deal of fun. I looked forward to that just as I hope readers will look forward to reaching Queen Sheirae’s palace. Originally, I wanted to pay homage to some of the visual effects of the Jean Cocteau film, Beauty and the Beast, but that didn’t come across as I’d hoped and it was cut. Trying to think up the architecture for a race that can fly led to much pondering in my office chair. The trogs are back. The goblins are back. We find out a bit more about the Samal wolves. But I confess that my favorite part of the book involves the lions of Embarthi. Did I plan those big felines ahead of time? Nope. They just roared their way into the book and stayed there. I’m glad they did. Magic is to fantasy what hot fudge is to a sundae … sublime! Will your protagonist have magical powers? Is magic common or unusual in your setting? Is magic feared and despised or considered desirable? How many and which characters will possess magical powers? What is the source of the magic? What are the limits to the magic? What does the magic cost? If you can answer these questions in terms of your story, then you’re well on your way to weaving magic intrinsically into the world and plot. But let’s consider the last two questions in more detail. Does magic carry a price? I think it should. At the very least it should bring a certain amount of responsibility for the character possessing extraordinary powers. If she can do anything she wants, can turn her teachers into toads and conjure up limitless quantities of hot cocoa with real whipped cream without suffering any consequences, pretty soon we’re going to have an individual out of control. Because power without restrictions leads to corruption, doesn’t it? After the initial rush of delight, the fun fades pretty fast and suddenly we’re sated with hot cocoa. So what else is there to get into? Consider the SORCEROR’S APPRENTICE segment of Disney’s animated classic film, FANTASIA. Mickey is lazy and wants to wield magic without putting in the necessary study and practice. He conjures up a spell to animate a mop into doing his chores for him, but pretty soon the magic runs amok and Mickey lacks the skills necessary to stop disaster. The best, most effective depictions of magic restrict it and set limits around its use. And there need to be consequences to using magic. That’s why the old fable restricts the genie in the bottle to granting only three wishes. It’s the limitation on the magic in Aladdin’s lamp that creates the fascination with this very ancient story: how will the wishes be used; how will they go wrong? You can set any parameters around your story’s magic that you want, but once you do you’re required to abide by them. This helps build natural suspense into the plot. What if, of the three wishes, there’s only one left and now the protagonist must decide between saving her poisoned friend’s life or saving her own as the dark wizard tries to destroy her? See the dilemma? Can you cheat through this, maybe fudge the magic a little so everything works out? Absolutely not! How can you enthrall readers if you cheat? Set the limits, push the limits, shove your protagonist through an awful choice, and let her battle the consequences. That keeps magic alive and vivid, woven through the very fabric of your story.